I'm sure Stephen Green had some of these in his yard once, but that would've been years ago. 175 D/S home and running, well Jerry rigged from a couple of cans, still a powerful piece of kit, dragged a 20 ton Taskers low-loader trailer with 4 of its 8 wheels locked on across the yard with ease. Going from memory. Either Leyland or Cummins engined, Clark transmission pretty bulletproof, rear CV joint a bit fragile. Brakes sometimes. Easy to work in a shower of what ever you were loading if not careful. Windscreen sometimes. Slow but reasonably reliable. I think the parking brake adjuster is a knurled on the top of the lever in the cab. Going from memory. Leyland or Cummins engined, Clark transmission pretty bulletproof, rear CV joint a bit fragile. Brakes sometimes. Easy to work in a shower of what ever you were loading if not careful. Windscreen sometimes. Slow but reasonably reliable. Yes Leyland Engine, Clark Transmission, currently no brakes, we don't have the cab and I will be careful not to to end up wearing what I'm carrying! We will give it a service and get all its key systems working properly, steam clean and a 20 yard paint job. If I read the plate on you Michigan 175 correctly, the VRN is 03 EU 76. 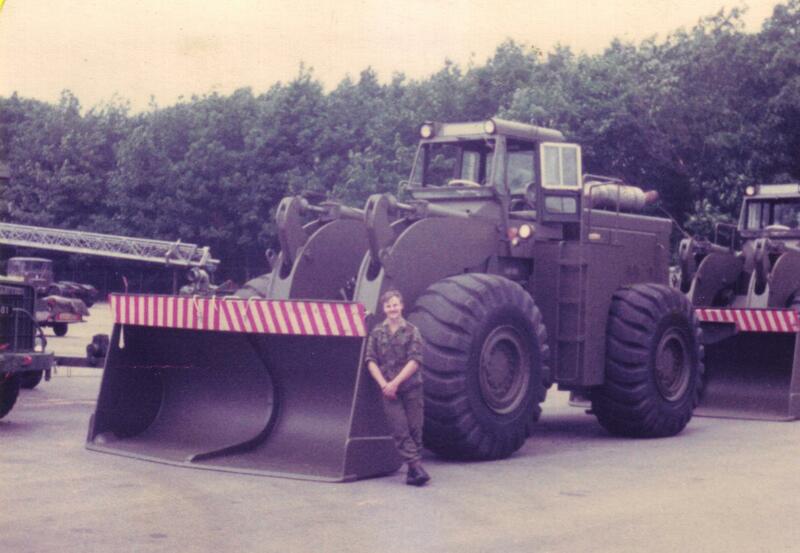 The attached photograph is of 03 EU 77 - logically this should have rolled off the Clarke production line straight after yours! 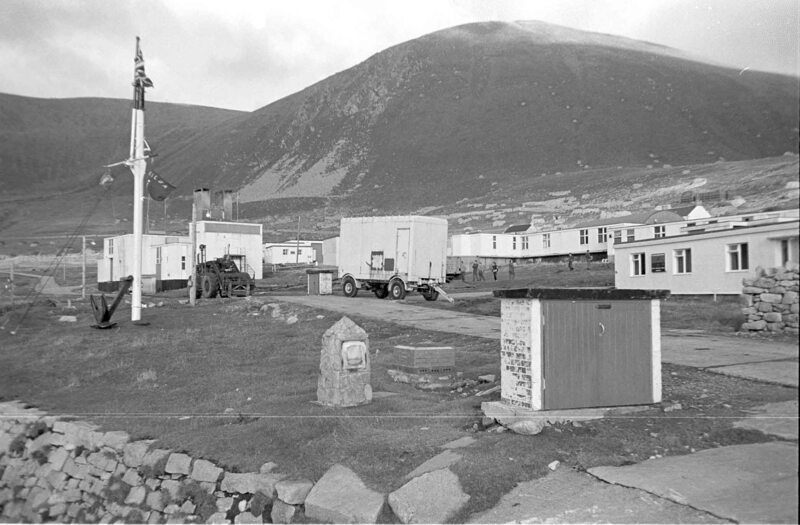 The photograph was taken on the island of St. Kilda where it was used in support of the Royal Artillery Ranges Hebrides. This is my first try at posting a photograph, so I'll press the trigger on the post before I try adding any more! 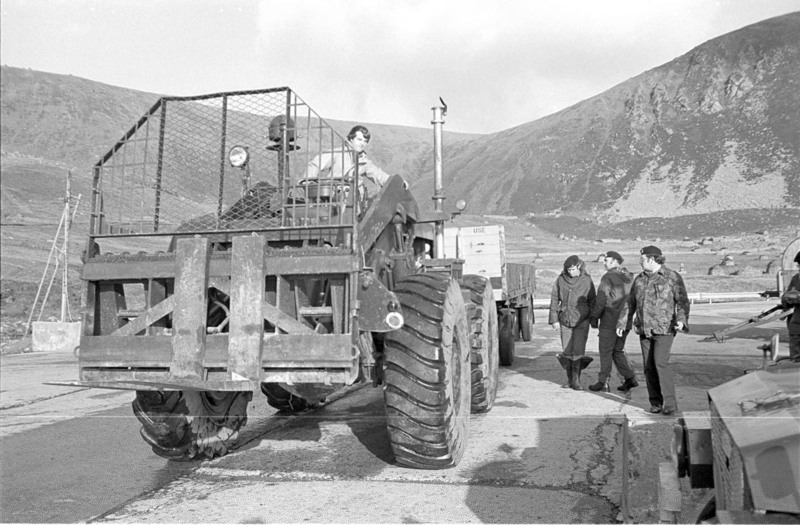 Another picture of 03 EU 77 on St. Kilda - being used as a tractor to move trailers around. The island was resupplied by LCT - 10 ton Tasker trailers were typically dragged ashore and unloaded with the Michigan. 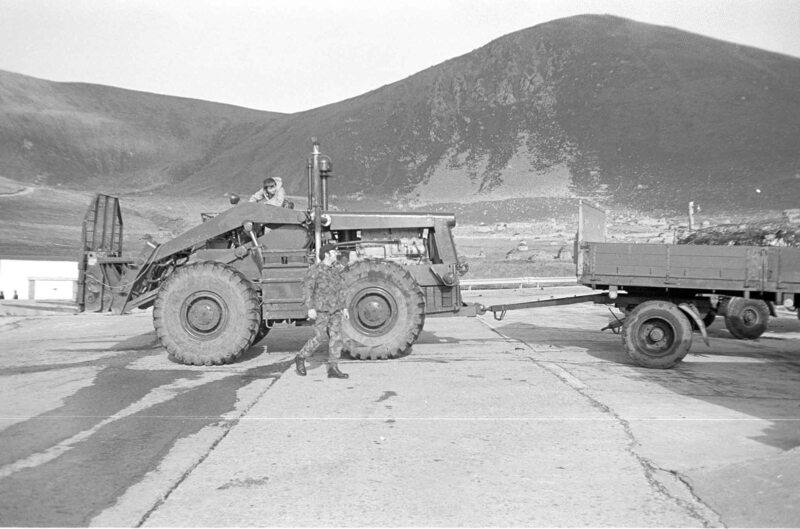 Empty trailers were placed on the helipad ready to be loaded back onto the ship. The odd thing about this picture is that the "rear" number plate is fitted on the right hand side of the fork carriage, though it does not carry the number of the equipment! This plate was usually only used when the machine was driven on public roads - it fitted into slots on the fork carriage and was held by a clamp bolt. It was wired into a (normally) capped plug on the boom. I note that your Michigan has the VRN painted on to the flat surface on the body above the fork carriage. The VRN was usually painted on the flat surface below the radiator on one end and on the removable number plate on the other. 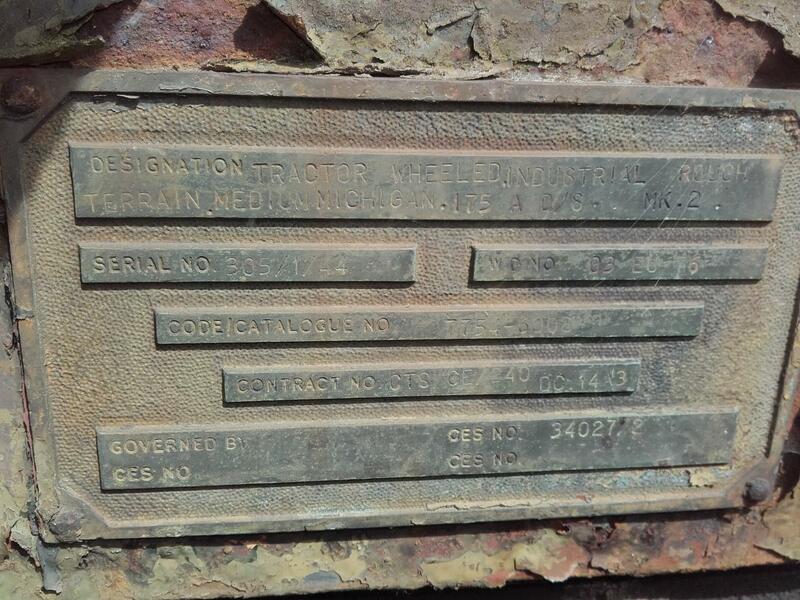 The plate seen on 03 EU 77 was vulnerable to damage during normal use as a fork lift and would usually be removed and held in the MT store until required for a road movement. Thanks David, love to see more pics and of any other plant. There seems to be an absolute absence of Military Michigan 175's on the web. The only thing I could find was a youtube clip titled "Army on Land, Sea and Air 1967"
Even here, there is only tantalising glimpses of the 175. 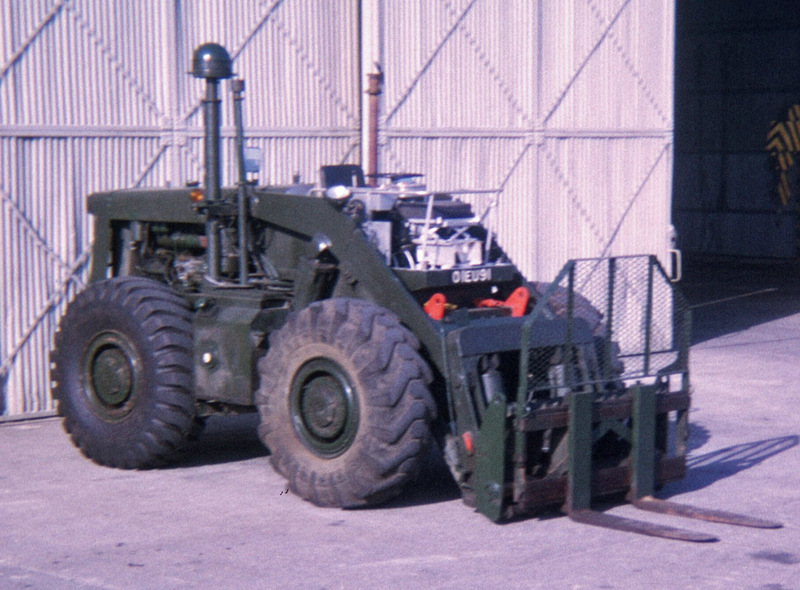 At 1:57 a 175 is the last equipment to drive off the mexefloat (it was preceded by a smaller Michigan of a type I didn't recognise). The camera covers from the point where the nose drives by and cuts out when it reaches the fuel tank! At 2:38 you think that you are going to see it parked up, when a Wessex flies by, dangling a pallet and completely obscuring it - I've never seen a piece of kit that was so damned camera-shy! (it was preceded by a smaller Michigan of a type I didn't recognise). that smaller Michigan looks like a 75, I remember the army having them in service. Richard - last pictures of 03 EU 77. First photograph shows the Michigan picking up the food trailer. 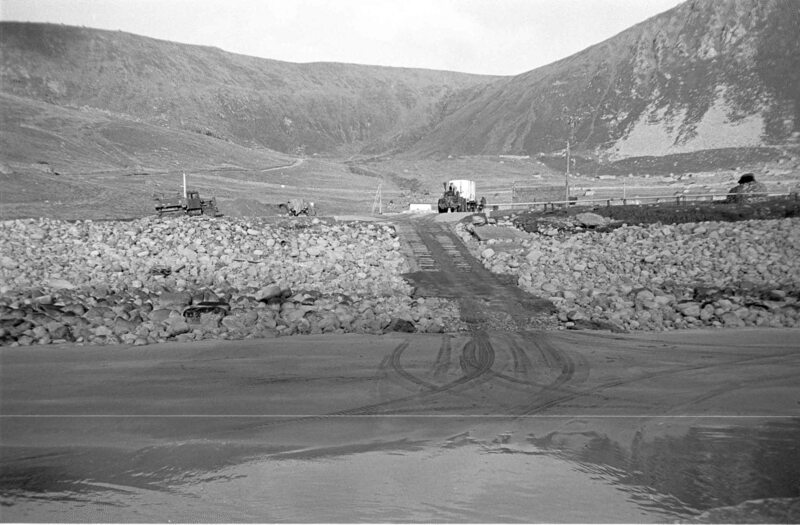 Rations were carried in the trailer from Benbecula to St. Kilda, kept fresh with blocks of dry ice. 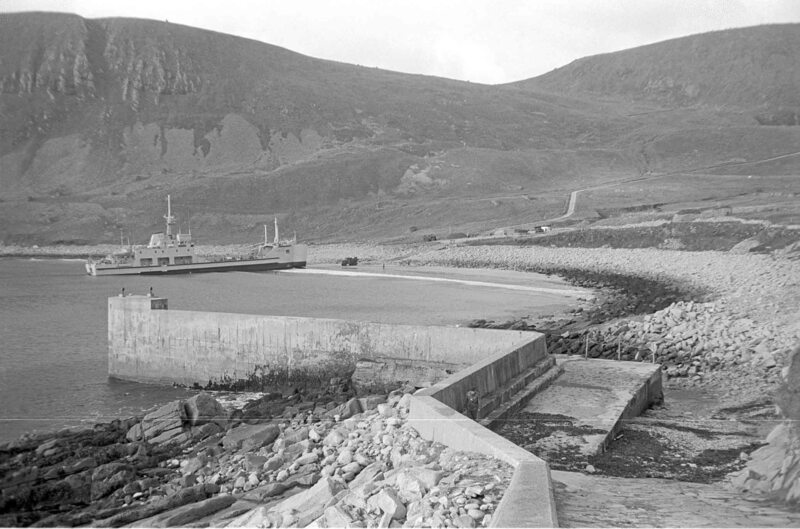 The picture was taken from the tank deck of the ship showing the ramp used to cross the shoreline, Scammell Explorer on the left. Second picture shows the food trailer dropped off at the military camp. Swing the camera left from that point and I took a picture of the Landing Craft with my Scammell Explorer sitting at the bow of the ship and the St. Kilda detachment's Explorer at the top left of the ramp. You are probably right - if you stop the film you can clearly read the word MICHIGAN painted in white on the yellow engine cover and, given Michigan's naming convention and the fact that its smaller than the 175 behind it, it's probably a 75 (as they would say in Star Trek - It's a 75 Jim, but not as we know it!). 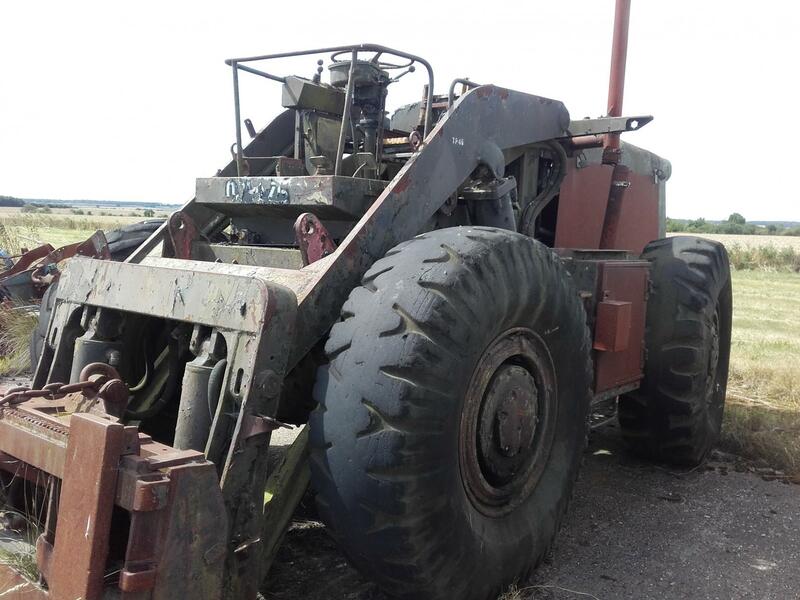 I have driven a 75 (picture attached) but this was obviously a much older example and looked ver different from that driving off the mexefloat (given the nature of the exercise, these machines were probably from 17 Port at Marchwood). 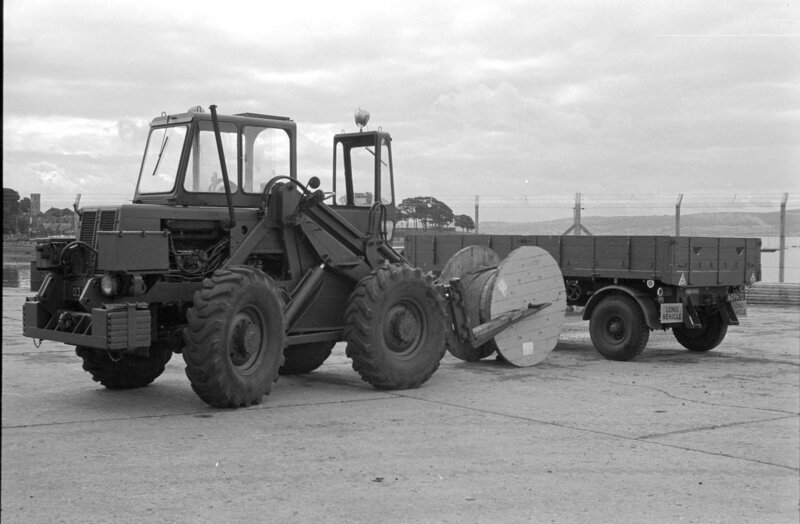 Both of these 75's in the picture came down from Benbecula (RA Ranges) on the ship and were headed for Ruddington for disposal. I drove the left hand one - we drove them from Helensburgh to Dumbarton station where we loaded them on to war well rail wagons - the 75 was "in gauge" for rail movement. 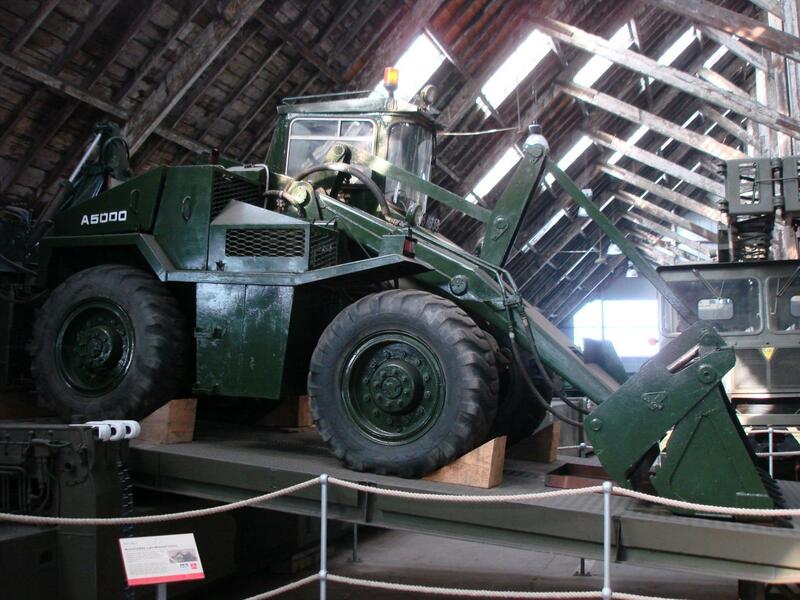 Couple of bits of plant at Chatham Historic Dockyard a few years ago ! Clark transmission and axle new parts should still be readily available at very sensible prices compared to modern stuff (which is mostly priced in telephone numbers). 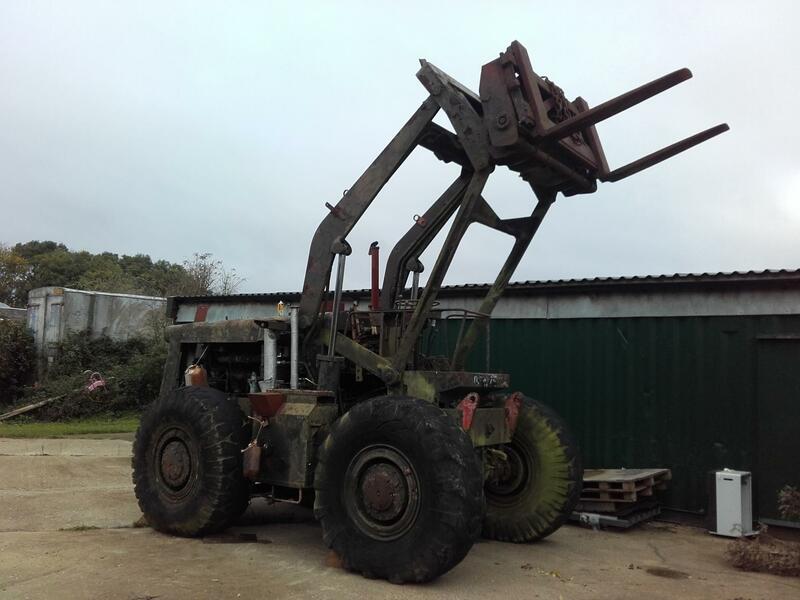 I think that you have nailed it - I agree that the small green forklift is indeed a Bray. After looking at the film again, the clue is the way that the various machines drive off the mexefloat. Most of the machines drive off "forks first" whereas the Michigan 175 and the Bray drive off with forks trailing. Both had front/rear facing seats and could be driven from both sides of the steering wheel. In the case of the Bray, lift the engine strangler lever, lift the steering wheel and flip it over to mesh with the forward drive cogs - sit with your back to the forks and you had a good road vehicle with the steering wheels at the normal front orientation rather than the back. On a different note, we have met previously under sad circumstances. 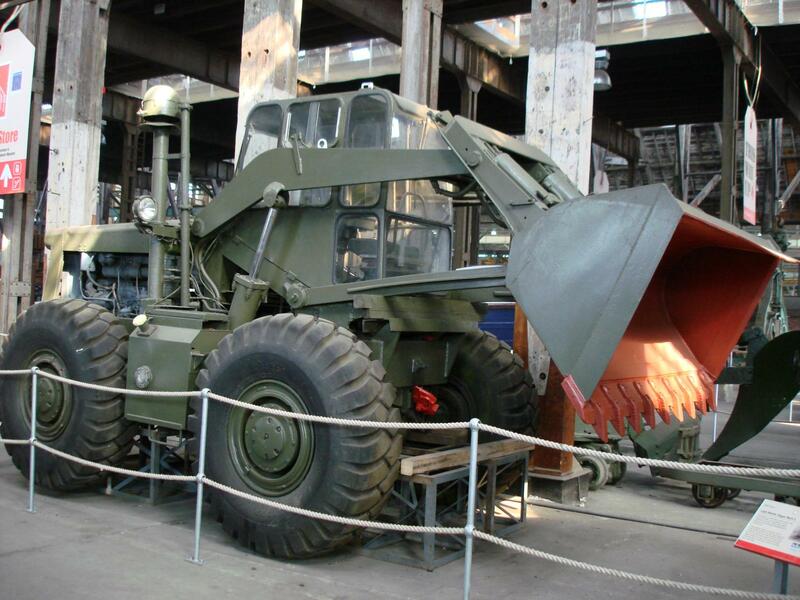 I was sent to the museum with an RCT Mover Sergeant to work out the logistics of removing MOD owned equipment when the museum first ran into trouble. The plan at that time was to move the kit North to Longtown for temporary storage. That particular plan never came to fruition and I was no longer involved in the project, but I still have vivid memories of you kindly showing me around the collection and of spending time in the records room where I was fascinated by the fact that I could look at the records of all the Scammels that I had driven. 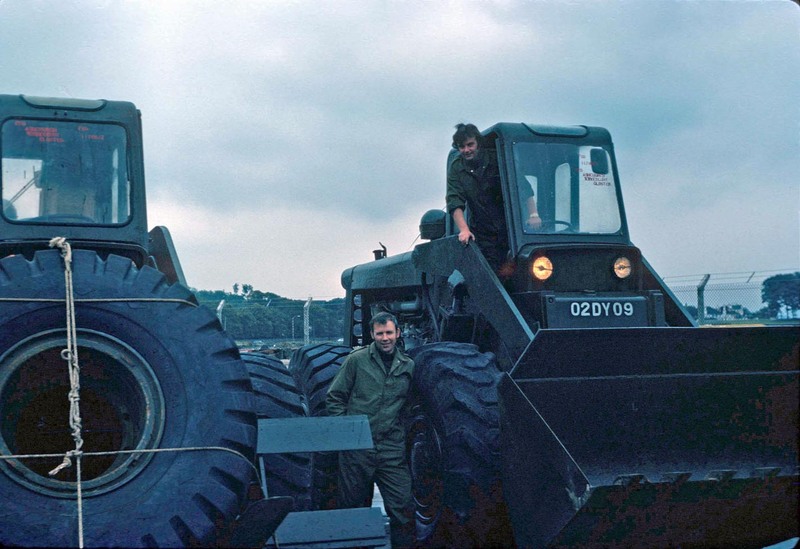 A picture of 01 EU 91 at Rhu Hangars Helensburgh taken in the mid seventies. This was an RA Range asset passing through on it's way to 26 Command Workshops in Stirling for repair. Looking at the picture, I see that it too has its VRN painted above the forks - maybe it was our 175 that was different in not having it painted there! 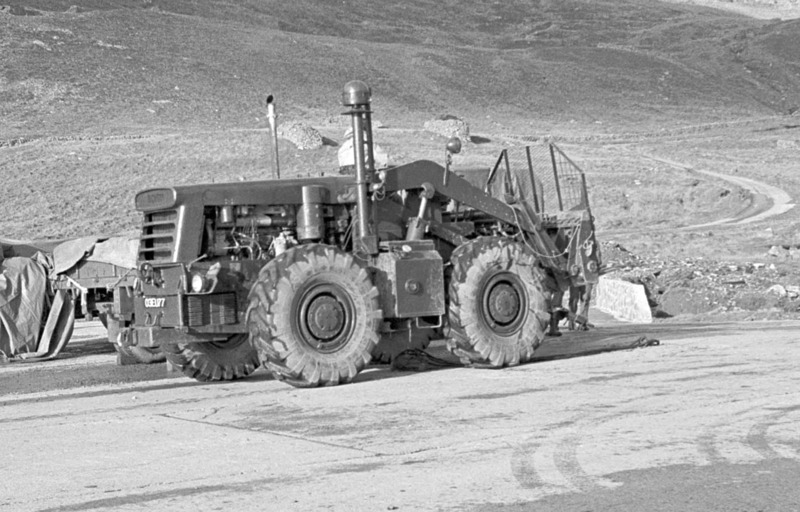 You can clearly see the "second seat" in this photograph - used when the steering was reversed and the machine was driven on the road. From the photographs of your Michigan I can see that yours has been removed - I would replace it - driving it in that direction is really good fun. The procedure was to remove the seat back (there was only one) from the seat facing the forks and fit it to the seat facing away from the forks. The switch panel was then spun round on the steering column and the machine then drove like a normal road vehicle. I remember that this was the first Michigan that I had driven without a cab - I felt really exposed. I was told that RA Ranges removed their cabs since they done far more wading than we did and, in the sea, if you can't see where you are putting your wheels there is always the chance that you could drive into a hole and overturn and have to jump clear - the standard cab would give you no chance of a quick exit and only allowed access from one side of the machine. If you look at the height of the breathers - it was said (though I never tested it) that the driver would drown before the Michigan would ever give up! Oh, that takes me back. in the 1970's I saw two LeTourneau 666 Missile launchers parked up there when driving into Rhu. Unmistakeable shapes ( the Dinky toy version made them famous ) though they didn't have the launch stand trailers with them. 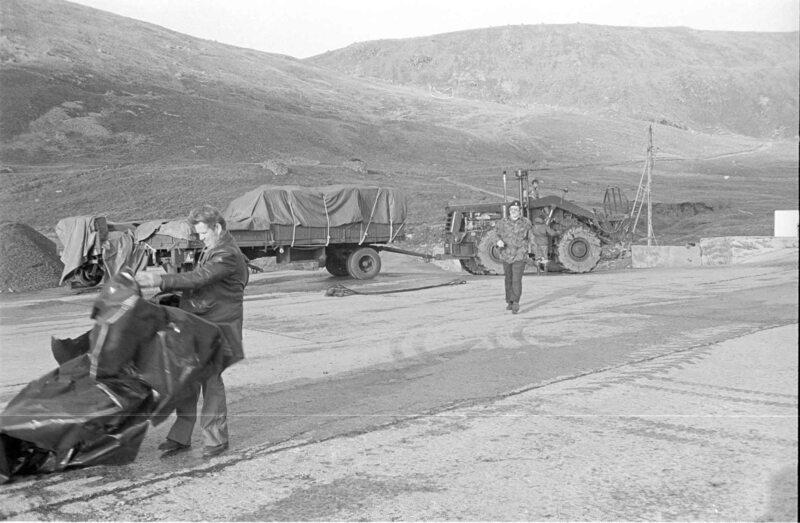 Apparently that was the land side dock for the landing craft to the Benbecula range, so they must have been going to or from there.